Sarojini Nagar is synonymous with Khandani Pakode Wala for me. Come winters, and people will queue up in front of the shop to relish hot and crispy pakodas with green chutney. Opposite to Pakode Wala, there is another food joint – Kulcha King, famous for its Amritsari kulcha and chhole. The address is Shop no. 144, Ring Road Market, Sarojini Nagar. The eatery has been set up by Avtar Singh Bagga, who originally hails from Pind Bagga, Tehsil Ajnala in Amritsar. Avtar Singh started his career with a small transport business. Due to the risky nature of the work and few accidents, he closed it down and started dealing in foreign currency. This work too did not continue for long and finally, Kulcha King yielded profitable dividends by satiating the taste buds of Delhiites. His son, Harjeet Pal Singh(contact no. : 8882335222), is a fine arts graduate from Punjab University and currently, runs this food joint. After 5 p.m., Harjeet works on his own sketching and painting. In fact, he has also designed the new website of his food joint: www.kulchakingfood.com . The man with a charming personality, who serves the kulchas at the table and refills the hollow containers of the plates with chutney and chhole is Ravinder Bun, famously known as Kukku (contact no. : 9643676146). He has a huge fan following, and students from nearby colleges just come at Kulcha King to interact with him. There are three varieties of kulcha at Kulcha King – mix kulcha (Rs. 70 for a plate), stuffed with aloo, gobhi, methi, pyaaz, adrak and dhania; mix kulcha (Rs. 80 for a plate), stuffed with gobhi, methi, pyaaz, adrak, dhania, with topping of ajwain and kali mirch; and paneer kulcha (Rs. 100 for a plate), stuffed with paneer, dhania, hari mirch and masalas. 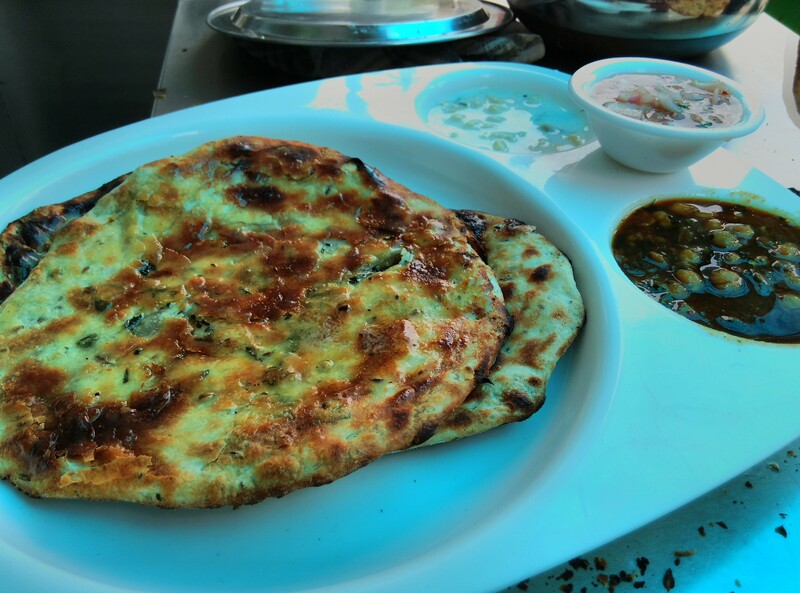 Each and every plate of kulcha is served with tamarind chutney, a mixture of spring onions, black salt, red onions, and cumin powder, and pindi chhole. The chhole has a subtle flavor of spices, not too spicy and oily. The chhole is cooked with masalas, and without adding any onions. I had the crispy mix kulcha smeared with Amul yellow butter. The fillings were good and very less maida was used in making the kulcha. I dipped a small bite of kulcha in chhole and chutney and relished the taste like a king. In the evenings, between 5 p.m. to 10 p.m., they serve some delectable dishes as snacks– Afghani soya, achari chaap, malai chaap and hariyali chaap and gravy- chaap tikka, paneer bhurji, soya keema, and soya kaleji. With this visit, I got another reason to visit Sarojini Nagar in the evenings. CRPF, the world’s largest armed police force and the proud sentinel of India’s internal security is all set to commemorate its Diamond Jubilee Year with the CRPF Mela 2014 from the 17th to the 19th of October. The three day extravaganza, organized by the CRPF family Welfare Association (CWA) is held at SDG headquarters, ISTM Grounds, Old JNU campus, New Delhi from 9 a.m. onwards. Reflective of real unity in diversity, the CRPF Mela presents scores of cultural shows, foot-tapping concerts, a delightful food festival which includes food stalls highlighting regional cuisine and a lot more. The three day event is a confluence of craft and culture and will be based on three themes: family welfare, women empowerment, and youth well-being apart from the Diamond Jubilee celebrations of the force. The programme will feature CRPF’s 75 year long journey in the form of a short film. CWA members will be honoured and CRPF personnel will be recognized for their bravery and valour. The CRPF family Welfare Association, a soul associate of the Force establishes firm support for the Force through the welfare and social domain. It works towards domestic empowerment, skill generation in the field of art and craft for families of the force and providing recreational avenues for the soldiers. The CRPF Mela is a conglomerated product of these efforts. Now coming to food, one can indulge themselves in a wide array of delicious Kashmiri, Gujarati, Punjabi, South Indian, and Rajasthani delicacies at the regional food stalls. Having a sweet tooth, I started my food journey with GC Durgapur food stall and tasted some of the best sweets of West Bengal, my favourite sweet being a burfi with the stuffing of aam papad. In the same food court, Aye 1 Café, Safdarjung enclave has a food stall selling – Awadhi style biryani, roganjosh, chicken curry, and chicken satay. The satay is a must try. It was soft and juicy, covered with a layer of peanut sauce and coconut milk. I was delighted to meet Prabhu Dayal, the supervisor of the J&K stall. He graciously introduced me to the J&K cuisine. I started with my all time favorite dish – Badarwa rajma and chawal. The beans were bright red in colour and delicious in taste. I also had Goshtaba, Yakhni, roganjosh, Rista, pulao and a delicacy of the streets of Jammu and Kashmir – Kalari Kulcha. Kalari is traditionally a ripened cheese product indigenous to Jammu and Kashmir. It is a very dense cheese that is usually fried in its own fat and salted prior to being eaten. After frying, it ends with a brownish crispy layer outside and soft, creamy, gooey cheese inside. The taste is similar to melted mozzarella cheese. Kalari, onion rings, and tomato slices are filled between the two kulchas with a topping of anardana ki chutney and served hot. The taste of Kalari Kulcha was heavenly. This is another must try in the CRPF Mela. Next, I visited GC Jalandhar food stall which has a nice welcoming name – “Bibiyan da Chulha”. The beautiful interior has been designed by Team Jalandhar GC led by DIG Mr. Sunil Thorb and Deputy Commandant Parvinder Kaur. The CRPF Jawans, in traditional Punjabi dress are serving food with warmth. I had Amritsari Kulcha with chole, Amritsari fish, chicken tikka, tandoori chicken, keema naan, sarson da saag te make di roti. The dishes must try in Punjab food court is fish and Amritsari Kulcha. The other food stalls are of Rajasthani, Gujarati, South Indian and Uttar Pradesh. I could not try much at these stalls. However, I am sure the food would be decent. My food journey ended with a cup of coffee at RAF 1 BN. Apart from the food stalls, folk dances, puppet shows and magic shows promise to add colour, vibrancy and fanfare to the event. So plan a visit to the CRPF Mela this weekend to taste the regional delicacies and experience the culture of different states at one place.